International efforts to douse raging Indonesia fires will fail and Southeast Asia could face several more weeks of choking smoke until the rainy season starts, Malaysia's environment minister warned on Monday. Facing growing pressure, Indonesia earlier this month agreed to accept international help after failing for weeks to douse the fires from slash-and-burn farming that have shrouded angry neighbours Malaysia and Singapore in smoke for weeks. But Malaysia was forced once again to close schools in several areas Monday due to unhealthy air, and Natural Resources and Environment Minister Wan Junaidi Tuanku Jaafar said the crisis could continue for another month. "Unless there is rain, there is no way human intervention can put out the fires," he told AFP on the sidelines of Malaysia's parliament session, warning that the blazes were spread across "huge areas" of Indonesia. Even the multi-nation effort now under way "is not enough to put out the fires," he added. "We hope the rains will come in mid-November. It will be able to put out the fires," Wan Junaidi said. On Friday, Indonesia launched its biggest fire-fighting assault yet, with dozens of planes and thousands of troops battling the illegally started agricultural and forest fires in its territory on the huge islands of Sumatra and Borneo. Thirty-two planes and helicopters—including six aircraft from Singapore, Malaysia and Australia—were deployed to back up more than 22,000 personnel on the ground. The fires and resulting region-wide haze are an annual dry-season problem, but experts warn the current outbreak is on track to become the worst ever, exacerbated by tinder-dry conditions from the El Nino weather phenomenon. The acrid air has sparked health alerts, sent thousands to hospitals for respiratory problems, and caused the cancellation of scores of flights and some major international events across the region. Indonesian National Disaster Management Agency spokesman Sutopo Purwo Nugroho also offered sobering comments Monday, saying the fires were "yet to be overcome." Sutopo said satellite data indicated Indonesia now had more than 1,500 "hotspots", which are loosely defined as areas where fires are either burning or where conditions are ripe for blazes to break out. "The actual number is higher as the satellite is not able to penetrate the thickness of the haze in Sumatra and (Borneo)," he added. 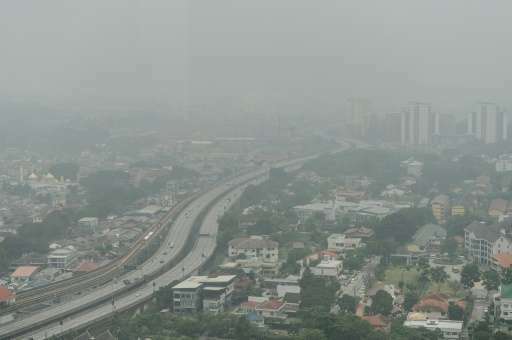 Malaysia enjoyed a brief spell of lowered haze last week, but the government—which has repeatedly ordered school closures across wide areas as a health precaution—did so again on Monday as skies once again reverted to the now-familiar soupy gray. Schools were closed in several states and in the capital Kuala Lumpur as pollution levels climbed well into the "unhealthy" range under the government's rating system. Air quality in Singapore, however, improved Monday after entering "unhealthy" levels over the weekend. Southeast Asia's haze: what's behind the annual outbreaks? This kind of greed fed profit mongering constitutes a "shepherd's rationalization" on an international scale. The 'small farmer' wants an easy 'profit' by burning some land maybe not even his or hers. It is the essential fraud of capitalism that it is completely based on lies, conceit, and fraud. Nothing is really 'free'. Someone or something pays! Always! So some overbred jerk that would not be here in the first place if their parents could have controlled their animal tendencies now robs the environment and the environment finally can take no more abuse and rebels. Now instead of nature absorbing these un-necessary costs, now people do. And the crimes total have grown so large that other nations are paying too for the collective greed, fraud, and irresponsibilities of greedy hooligans bent on 'profiting' from their crimes by making others suffer as well. One day these acts will generate wars. I would like to see a time lapse of industrial progress from the 1770's to today from space. I bet it would look like some kind of explosion went off on earth, leaving a wasteland in its wake as it spread around the sphere (and flung some bits off into space in the last few decades).